I love the theatre! There’s nothing like seeing actors perform live, right in front of you. At every performance, when the show begins, they have only one chance to get it right. The way I see it, only the most highly skilled and disciplined of actors have what it takes, the mettle, to act on stage. Theatre means the world to me! So, you can imagine how happy I was when Jill McIntyre, Associate Director for Development at the Tony Award-winning La Jolla Playhouse, took time from her busy schedule for an interview with me! The Playhouse is no ordinary theatre. Sure, it’s one of my favorite theatres, but not because it’s renowned for creating extraordinary productions that have gone on to Broadway. What makes the Playhouse so special is its commitment to pushing the envelope, to being cutting edge, finding the next big talent, encouraging creativity and originality, and for taking risks. And, while not every play may work, when it does, it soon becomes a mega-hit. Think, Jersey Boys, Thoroughly Modern Millie and The Who’s Tommy. I met Jill in our LEAD San Diego Impact class, and was immediately impressed with her exuberant personality and beaming smile. She’s bubbly, warm and super energetic. Plus, she’s a real go-getter who knows what she wants. It’s no wonder she excels in her job! MTW: So, Jill, what sparked your interest in theatre? JM: As a child, I was always imaginative, and just loved to act. My parents would take me to see plays and I developed a love for theatre early on. While in college, I studied abroad in Edinburgh, Scotland, which is renowned for its theatre. I got involved, writing and acting in a musical at the Edinburgh Fringe Festival, the world’s largest arts festival. It was so exciting to be there, amid thousands of people performing. I’m actually going back this year! This experience helped solidify my passion for theater, but it also made me see that I didn’t want the nomadic lifestyle of an actor. I joined the Playhouse six years ago, and I really love it here. MTW: What makes the La Jolla Playhouse special and what role does it play on the national theatre landscape? We send huge amounts of plays to Broadway. Since the early eighties, we’ve had 70 world premieres here, of which 40 were commissioned by the Playhouse. Sixty have been performed elsewhere, in other cities and towns, including on Broadway. In fact, right now, four shows, that began here, are playing on Broadway: Jersey Boys, Jesus Christ Superstar, Memphis, and Peter and the Starcatcher, (which just won five Tony Awards). Yet, our goal isn’t to make shows for Broadway, but to create new works for San Diego. Oddly, though, we are better known nationally than we are here. That’s because here in San Diego, we’re known for our beaches and for being a military town. So, it’s our job to get the word out. Theater in San Diego is very special, and I’d love to see it listed among the things the city is known for. MTW: What’s the secret to the Playhouse’s success? JM: The amount of time we give creative teams to rehearse, figure out the technical elements, work out the kinks, and hold previews. Generally, theaters allow five weeks for this process. We allow nine. So, we offer far more prep time, which ends up attracting the best-known directors and actors. That’s a lot of the reason why our shows go on to Broadway, and have won for us, 30 Tony Awards. 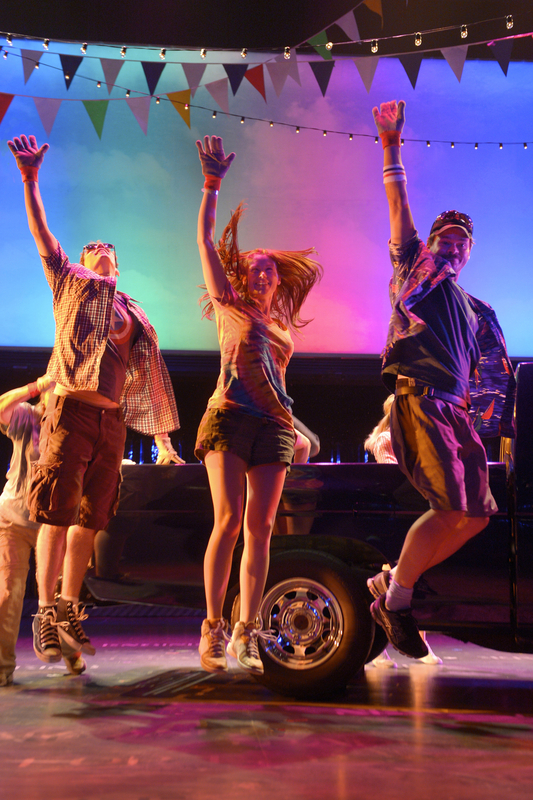 MTW: What has been your favorite production at the La Jolla Playhouse? The Farnsworth Invention. I loved it because the writer was Aaron Sorkin (of The West Wing fame). He is such a nice man. His writing sizzles, and I loved that it was a true story. Plus, the director was Des McAnuff, (who headed the Playhouse for 25 years). But, it went to Broadway, and wasn’t a success. There was a strike going on at the time, which might have contributed to its closing. MTW: What is the La Jolla Playhouse doing to attract and interest young people in theater? JM: Cuts in art education are a huge reason why we don’t see young people thinking about theater. We have special programs for kids; we commission a play every year and tour it around schools, reaching 18,000 children each year. We’re really trying to expose people to the arts, and are looking at younger audiences now. We have an under-30 program, in which we charge $20 per ticket, making it very doable for their budgets. We also have a program called Foodie Friday. Two hours before the Friday performance, gourmet food trucks, which are the latest trend in San Diego, park outside the theater, selling great gourmet food for $10 or less. The beer is free, courtesy of a local brewery. Free booze, good food and entertainment. It’s so popular! MTW: What famous actors have been spotted at the Playhouse? Our most recent play, Hands on a Hard Body (pictured above), starred Keith Carradine. His daughter, actress Martha Plimpton, stopped by, and so did Natalie Portman, whose husband, Benjamin Millepied (The Black Swan), is the choreographer. MTW: What’s next for the Playhouse? JM: I’m so glad you asked! For 2013, we’re planning a Without Walls Festival, or WOW, as we call it. What’s exciting about this is that we’ll be developing new work, honoring the mission of exploring the reaches of what theatre can be. It’s a thrill to break with the tradition of theatre as we know it, and take risks–sprinting well out of our comfort zone. Best of all, the Playhouse will be bringing acclaimed national and international theatre artists to share their own ground-breaking work with San Diego, and they’ll be commissioning original theatre pieces inspired by our community. MTW: Sounds so cool, Jill. Bound to be something for everyone. I can’t wait! So, what book are you currently reading? JM: I’m rereading The Paris Wife (by Paula McLain) because I’m going to Paris this fall. I love Hemingway, and am so excited about the trip. MTW: How do you find your bliss? JM: Bliss is anytime I’m not wearing my Spanx. I’d rather sit around in my pajamas! Mostly, though, I find my bliss through my work and representing something I really believe in. I’m lucky to have a job that doesn’t always feel like a job. So, how about you? What does the theater mean to you? What a lovely interview Monica, Jill seems so down to-earth and passionate about what she does. Theater was always first and foremost Shakespeare to me. I’ve seen Tolkien’s Hobbit – a one man show from England, I’ve seen The Merchant of Venice – Oh to go to a Shakespeare festival would be so wonderful. I hardly ever get to go now but I am thinking of taking my girls to see ‘The Lion King.’ I have missed it so many times that I think, it’s now or never. One of my first Broadway experiences was ‘Annie Get your Gun’ with Reba McEntire. It was the perfect NY day. I have so many that I want to see, I wish I could go to all. MM, I went through a period in high school when I was completely and utterly obsessed with Shakespeare. But since then, I’ve expanded. My favorite musicals are pretty much any by Rogers & Hammerstein, and my favorite drama is Our Town by Thornton Wilder, which I first saw performed by my high school. It is so profound and yet so simply told, that to this day, I get emotional seeing it. I hope you get to take your girls to the theatre soon. It’s so important to start them young so that they can develop a lifelong love for it. Please, please read the play. But it won’t do it justice until you see it. It’s such a classic that theatre troupes, the world over, perform it. I wouldn’t doubt it, if every 15 minutes somewhere in the world, some theatre company is beginning its rendition of Our Town. Sheesh.That does it. I’m going to have to blog about it. In my “past life as a newspaper reporter,” I covered lots of community theater productions and loved it immensely! There’s nothing quite like seeing an ordinary group of citizens from all walks of life gathered on stage — live — and reciting their roles to their hearts’ contents! I agree with you that musicals are probably my favorite — when I was little, I saw “Jesus Christ Superstar” live in Chicago, and it was an experience I’ll never forget! Seeing a live show on Broadway is definitely on my bucket list! Lucky you, Debbie! That must have been so much fun to do. Can you believe, a few years ago, I took my daughter to NYC. It was her first visit and we ended up seeing six–count them!–Broadway shows in ONE week! We must have broken some record. It was a week we’ll never forget! Nine weeks instead of five to prepare – that’s got to be a huge attraction for actors, directors, and crew. The Playhouse is beautiful. Jill has the perfect job! Actually, Eloise, it turns out that it’s 9 weeks instead of 4 1/2! So that’s twice as much time to prepare, which would be attractive to any director or actor, if you ask me. No wonder, so many want to create theatre there, at the Playhouse. It’s such a wonderful creative outlet! Live theatre is always so much fun. I don’t get to go as often as I’d like, and La Jolla’s a bit far for me, but there’s something about the energy and excitement of a live show that is way different from movies, entertaining as those can be. Thank you ladies, both, for an interesting look at the La Jolla Playhouse. Great interview Monica! I adore all things theatre. My daughter in is an acting troupe, ACT For Youth, and also demonstrates audition tips to groups of kids on how to land a part; explains a few theater terms; and displays posters illustrating her ideas. Her troupe does four productions per year, and I’ve lost count how many shows she’s done. But it looks like she might be Broadway bound too. We’ll see. -What a superb interview, Monica & Jill. I enjoyed every word. I sooo Wish I lived nearby! Loooove this sentence: **His writing sizzles.” Fabulous. What a terrific interview . . . .I have nothing but respect for companies like this one that really are the heart and soul of theatre. Sure, living in New York makes the mega hits considerably more in your face but it’s so often the smaller (often experimental) plays, 0ff-Broadway that interest me more. I did see ‘The Book of Mormon’ recently, and it really was wonderful but ‘War Horse’ (the theatre version), which a friend took me to for my birthday was utterly amazing. Fabulous interview, ladies. I’ve never been drawn to act but I have been going to the theater since as long as I can remember, so I share this passion. As for Tosh’s idea, I am thinking a youtube skit of some sort… would be a fun idea. May reenact the recent murder mystery. I know, Totsy, I wish it weren’t the case. Kids end up missing out on so much because of it. I like your idea about a web-play. That could be a lot of fun! My husband and I love to go to La Jolla PlayHouse.They also must have a wonderful costume department. Just love it! So much work goes into the plays. These responses are so sweet! Thanks all and come visit us at the Playhouse soon! Jill, I think there are a lot of new fans of the La Jolla Playhouse now. They love your enthusiasm for theater and it’s contagious! Gosh, it’s been so long since I’ve been to the theater, but this is a wonderful interview. I need to see something soon. Hope you had a good weekend, my friend! By the way–great title for this post! LOVE IT! Thanks, Kathy! I hope you and Sara get to go to the theatre soon. It’s fun, and often gives you food for thought. Read your post earlier and will be by soon to comment. Hope you’re feeling better. Thanks, Misty! Glad you enjoyed it! So, was the play you and SO saw in English? What was it? I like all sorts of plays, but probably musicals best. Though I do love plays by George Bernard Shaw, Thornton Wilder, August Wilson and Moliere. Of all, my favorite is Wilder’s “Our Town.” A classic. Great interview Monica! We have never been to the theater but we enjoy the theater of life that plays out in front of us each day. Jill sounds like a remarkable human! Well, Bella and DiDi, there’s nothing like the theatre and you know what they say, right? All the world’s a stage! Love, love, love the La Jolla Playhouse! I’m so glad you do. Great location for those coming from LA or thereabouts. And depending on the day of the week, the parking is free! We should all have jobs that are not real jobs! Jill sounds like a fun girl! She is invited to our coffee date! I can feel her energy right through the page! Jill’s great. I love people who are passionate about what they do. It’s very inspiring! Anything La Jolla gets my juices flowing. As a child I spent a few summers and weekends there when my father married a woman who owned an incredible home on the cliff of La Jolla shores. My friend and I would walk all over town, exploring. I wish we would have discovered the theater and begged my dad to take us! I did get to see “The King and I” in San Diego with Telly Savalas, and that is a favorite memory. Homeschooling allows us the freedom to explore the arts-and we do! The Orange County Performing Arts Theater allows us to see top-notch plays during the day (all kids and teachers/parents) for $5 each. We are so fortunate to have this, and see about eight plays each year. This year it will be more! But after reading this, I am now dying to travel to La Jolla to visit the Playhouse. This was an exciting interview with such a dynamic gal. Thanks Monica! What a wonderful interview. I love live theater, too, but don’t get to see very many productions. That’s got to change, especially since I have access to the La Jolla Playhouse and so many other great San Diego theatres. You’ve inspired me to start getting those tickets. Thanks! That’s an impressive cast of previous actors. Our community college has a nice theater where traveling productions are staged and about an hour from us is a dinner theater. Thoroughly Modern Millie was put on there and I instantly thought of it when I saw the title. It is usually just locals coming together for experience, but they are uncommonly good for a little local entertainment. It’s a very impressive theatre, too. The arts are so important to our well being and add so much to who we are. Theatre, no matter its size, or its acclaim, should be supported and celebrated everywhere. It’s nice to know that your community college has made a commitment to theatre, for a life, that has been touched by all that it has to offer, is truly an enriched one. I must admit that in my life I have never been to the theatre much, but I have known a fair number off people who have worked in them. For a period I worked in Stratford upon Avon just a stones throw from the Royal Shakespere Theatre and met meany interesting people. Actors I have spoken to who were any good at their craft and I am not including the here today forgotten tommorrow actors that appear in minor TV roles all say they prefer the live theatre to any other medium. We have a couple of theatres here in Peterborough but they are quite minor and never have anything on that would tempt me to pay them a visit. Certainly from what I read and have read many places now especially in London are looking to break new ground if only to get people in, as money is tight at the moment, and apparently the Olympic games are not helping London audience figures either. Jill McIntyre seems an interesting committed person and it shows in your post that you enjoyed speaking to her very much. Years ago I always said I would love to go to the Edinburgh Festival which people visit from all over the world, one day I may just make it!! !